Niccolò (or Nicolò) Paganini (Born 27 October 1782 – 27 May 1840) was an Italian violinist, violist, guitarist, and composer. He was the most celebrated violin virtuoso of his time, and left his mark as one of the pillars of modern violin technique. His 24 Caprices for Solo Violin Op. 1 are among the best known of his compositions, and have served as an inspiration for many prominent composers. Niccolò Paganini was born in Genoa, then capital of the Republic of Genoa, the third of the six children of Antonio and Teresa (née Bocciardo) Paganini. Paganini's father was an unsuccessful trader, but he managed to supplement his income through playing music on the mandolin. At the age of five, Paganini started learning the mandolin from his father, and moved to the violin by the age of seven. His musical talents were quickly recognized, earning him numerous scholarships for violin lessons. The young Paganini studied under various local violinists, including Giovanni Servetto and Giacomo Costa, but his progress quickly outpaced their abilities. Paganini and his father then traveled to Parma to seek further guidance from Alessandro Rolla. But upon listening to Paganini's playing, Rolla immediately referred him to his own teacher, Ferdinando Paer and, later, Paer's own teacher, Gasparo Ghiretti. Though Paganini did not stay long with Paer or Ghiretti, the two had considerable influence on his composition style. The French invaded northern Italy in March 1796, and Genoa was not spared. The Paganinis sought refuge in their country property in Romairone, near Bolzaneto. It was in this period that Paganini is thought to have developed his relationship with the guitar. He mastered the guitar, but preferred to play it in exclusively intimate, rather than public concerts. He later described the guitar as his "constant companion" on his concert tours. By 1800, Paganini and his father traveled to Livorno, where Paganini played in concerts and his father resumed his maritime work. In 1801, the 18-year-old Paganini was appointed first violin of the Republic of Lucca, but a substantial portion of his income came from freelancing. His fame as a violinist was matched only by his reputation as a gambler and womanizer. In 1805, Lucca was annexed by Napoleonic France, and the region was ceded to Napoleon's sister, Elisa Baciocchi. Paganini became a violinist for the Baciocchi court, while giving private lessons to Elisa's husband, Felice. In 1807, Baciocchi became the Grand Duchess of Tuscany and her court was transferred to Florence. Paganini was part of the entourage, but, towards the end of 1809, he left Baciocchi to resume his freelance career. For the next few years, Paganini returned to touring in the areas surrounding Parma and Genoa. Though he was very popular with the local audience, he was still not very well known in the rest of Europe. His first break came from an 1813 concert at La Scala in Milan. The concert was a great success. As a result, Paganini began to attract the attention of other prominent, though more conservative, musicians across Europe. His early encounters with Charles Philippe Lafont and Louis Spohr created intense rivalry. His concert activities, however, were still limited to Italy for the next few years. In 1827, Pope Leo XII honoured Paganini with the Order of the Golden Spur. His fame spread across Europe with a concert tour that started in Vienna in August 1828, stopping in every major European city in Germany, Poland, and Bohemia until February 1831 in Strasbourg. This was followed by tours in Paris and Britain. His technical ability and his willingness to display it received much critical acclaim. In addition to his own compositions, theme and variations being the most popular, Paganini also performed modified versions of works (primarily concertos) written by his early contemporaries, such as Rodolphe Kreutzer and Giovanni Battista Viotti. Paganini's travels also brought him into contact with eminent guitar virtuosi of the day, including Ferdinando Carulli in Paris and Mauro Giuliani in Vienna. But this experience did not inspire him to play public concerts with guitar, and even performances of his own guitar trios and quartets were private to the point of being behind closed doors. Throughout his life, Paganini was no stranger to chronic illnesses. Although no definite medical proof exists, he was reputed to have been affected by Marfan syndrome or Ehlers–Danlos syndrome. In addition, his frequent concert schedule, as well as his extravagant lifestyle, took their toll on his health. He was diagnosed with syphilis as early as 1822, and his remedy, which included mercury and opium, came with serious physical and psychological side effects. In 1834, while still in Paris, he was treated for tuberculosis. Though his recovery was reasonably quick, after the illness his career was marred by frequent cancellations due to various health problems, from the common cold to depression, which lasted from days to months. In September 1834, Paganini put an end to his concert career and returned to Genoa. Contrary to popular beliefs involving his wishing to keep his music and techniques secret, Paganini devoted his time to the publication of his compositions and violin methods. He accepted students, of whom two enjoyed moderate success: violinist Camillo Sivori and cellist Gaetano Ciandelli. Neither, however, considered Paganini helpful or inspirational. In 1835, Paganini returned to Parma, this time under the employ of Archduchess Marie Louise of Austria, Napoleon's second wife. He was in charge of reorganizing her court orchestra. However, he eventually conflicted with the players and court, so his visions never saw completion. In Paris, he befriended the 11-year-old Polish virtuoso Apollinaire de Kontski, giving him some lessons and a signed testimonial. It was widely put about, falsely, that Paganini was so impressed with de Kontski's skills that he bequeathed him his violins and manuscripts. In 1836, Paganini returned to Paris to set up a casino. Its immediate failure left him in financial ruin, and he auctioned off his personal effects, including his musical instruments, to recoup his losses. At Christmas of 1838, he left Paris for Marseilles and, after a brief stay, travelled to Nice where his condition worsened. In May 1840, the Bishop of Nice sent Paganini a local parish priest to perform the last rites. Paganini assumed the sacrament was premature, and refused. 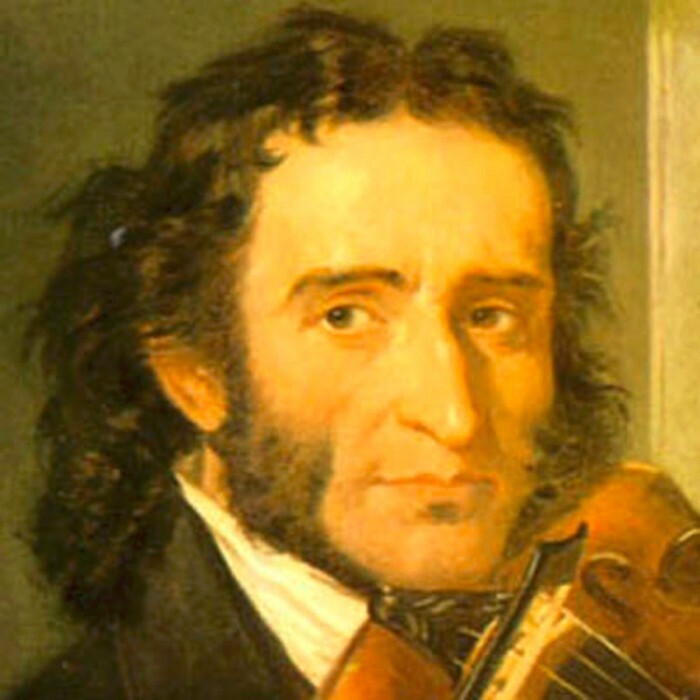 A week later, on 27 May 1840, Paganini died from internal hemorrhaging before a priest could be summoned. Because of this, and his widely rumored association with the devil, the Church denied his body a Catholic burial in Genoa. It took four years and an appeal to the Pope before the Church let his body be transported to Genoa, but it was still not buried. His body was finally buried in 1876, in a cemetery in Parma. In 1893, the Czech violinist František Ondříček persuaded Paganini's grandson, Attila, to allow a viewing of the violinist's body. After this episode, Paganini's body was finally reinterred in a new cemetery in Parma in 1896.